Let’s just admit it. We’ve all wished for our own personal dolphin at one point or another, right? Or maybe even wished we could just be one? Of course we have. They’re such beautiful, playful creatures — who wouldn’t want to frolic in the ocean all day?! I’m sorry to tell you, but these 11 facts aren’t going to make you forget about that wish — they’re going to make it real again. In honor of National Dolphin Day on April 14, here are all the reasons I want (or want to be) a dolphin, and I’m guessing you do, too. No matter what your tastes, we can almost guarantee there’s a dolphin out there for you. There are over 40 species of dolphins around the world, ranging in size from 4 to 25 feet. Most dolphins spend their time in shallow ocean waters. That sounds like a place you could hang out, right? That’s right! There are five varieties of freshwater dolphins, so there’s no reason to give up your dreams if you don’t have ocean access. Dolphins love to roll with a good crew. They live and travel in groups that range from 2 to 40 dolphins, and are seldom seen alone. Members of a dolphin pod work together to do everything, from raising their children to gathering fish for meals, and they always make sure everyone gets a turn. So thoughtful! 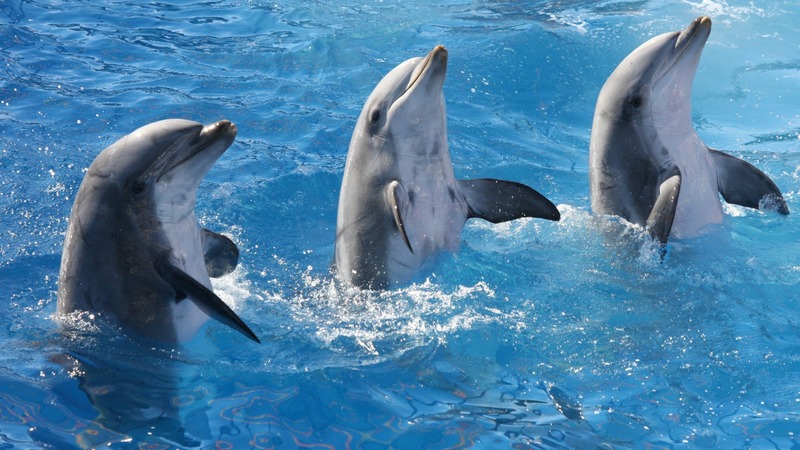 Dolphins speak to each other using sounds like clicks, squeaks and whistles. So as long as you can learn to do that, you can communicate with your new dolphin friend. Totally worth it, right? It’s a well-known fact that dolphins are extremely intelligent. They display that in the way they communicate, use tools, learn tricks and display culture — a trait that’s rare in animals. Dolphins never leave a man behind. They stay behind with injured friends, even helping them get to the surface to breath. And their altruistic tendencies don’t stop with fellow dolphins. They’ve been documented helping other animals, including whales, as well as humans. That sounds like someone I’d like to have on my team, for sure! They’re not all pretty jumps and watery kisses. Dolphins have been serving in the U.S. Navy since 1960, helping to locate underwater mines and searching out enemy swimmers. Since dolphins live in the water but breathe air, falling completely asleep would be a recipe for disaster. Instead, they rest their brains one side at a time, remaining conscious at all times. We’d all like someone on our side who never misses anything. We all knew this one, right? Dolphins are silly, playful animals that love to have a great time with their friends. They play, pretend to fight, balance on their tails and can leap as high as 25 feet out of the water. Sounds like the perfect playmate to me. So, are you ready to ditch your feet for flippers and join them yet?